Stephanie Surface shows how the EU’s undemocratic constitutional arrangements deprive the elected EU Parliament of any real power, and thus render the coming EU elections an elaborate charade. In a couple of weeks, voters will be electing candidates for the new EU Parliament. Brussels is trying to put on the cloak of legitimate “democracy”, but on closer inspection, the whole exercise turns out to be nothing but a sham. As a matter of fact, if the EU was an individual country, it wouldn’t in 2014 be allowed to join itself, because of its very lack of basic democracy. In a democratic election, every vote should have the same value. But if you live in Greece, one MEP needs to be backed by merely 490,000 votes, compared to a German MEP who needs the backing of 1.4 million. 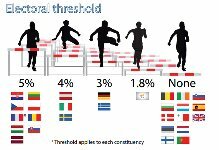 On top of that, each EU country has different electoral thresholds. There’s also the question why voters of different member-states shouldn’t vote for a party or candidate of another country: i.e an Italian citizen voting for a British party or MEP? The fact is that the so-called “European” vote stays a national vote run on unequal conditions. Brussels also claims that this time the election will be truly democratic, since changes were made in the Treaty of Lisbon (ironically called “Treaty on the Functioning of the European Union”), which supposedly gives the EU Parliament the role of a bicameral legislature alongside the Council of Ministers. But looking closer at the running of the Brussels EU institutions, it turns out that not only are candidates for Commission President or top Commissioners mostly chosen from the internal pool of the unelected and unaccountable Brussels’ bureaucracy, but the European Council ( heads of the 28 governments) is the sole institution which has the power to propose nominees. The EU Parliament has no right whatsoever to name any candidates, and can only “suggest” laws which the Council/Commission might consider or not. It means that the ordinary EU voter has no influence whatsoever over any legislation, or over who should be in an EU “government”. As the current two top candidates for President, Martin Schulz and Jean-Claude Juncker, were recently nominated by the European Council (and make no mistake, you could barely get a cigarette paper between their virtually-identical socialistic, bureaucratic, centralised outlooks) many MEPs say it is a choice between the Cholera and the Plague. Furthermore, it seems that most EU Commissioners, appointed by current EU member-state governments, are either failed politicians in their respective countries, or seem never to have done any worthwhile activity outside politics or quangos. Additionally some have never even been elected to public office by their own citizens: as in the case of Baroness Ashton, the current EU’s High Representative for Foreign Affairs and Security Policy. The ordinary European voter has next to zero influence on policies or governance, as there seems to be a total lack of checks and balances in the power structure of the Brussels machinery. No Commissioner or bureaucrat can be removed, short of him/her committing a serious crime, and certainly not by voters dissatisfied by his/her performance. The apathy in European countries to voting at the EU Parliament election is huge: 59% don’t even bother to go to the ballot box. What is worse, even if EU/euro-sceptics make up as much as 20% of the Parliament of 751 members, the lack of democracy purposely designed in to the EU’s bureaucratic and constitutional arrangements means that they won’t make any impact on legislation, governance or have the possibility of moving some of EU’s power back to their own legitimately elected national parliaments, because the institutional architecture is designed specifically to prevent it. The only glimmer of hope is that a big percentage of EU-sceptic votes will have an impact on national governments. Many pro-EU politicians who try to justify this huge bureaucratic, anti-democratic monster will do themselves no favours by calling EU-sceptic parties “populists” or “nationalists”, as more and more European voters are getting fed up with an institution which doesn’t reflect any true democratic legitimacy whasoever.